“He was a good man. And all we can do is remember him. 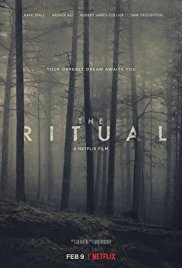 “The Ritual” is a British horror that takes place in a Swedish forest where four friends go on a hike in honor of a deceased friend. After seeing so many films where a dark forest provides terrifying and life-threatening situations, I made a decision. I’ll never spend a weekend somewhere in a forest far from the civilized world in my life. Much too dangerous. In addition, it’s also certain that I’ll watch more of those Netflix Originals. Because these films, which are sometimes turned down by big film companies, really aren’t so bad. An adventurous hike turns into a survival trip. “The Ritual“, however, wasn’t a complete success. The first part is without a doubt the most impressive. A continuous feeling of threat and desperation, because this piece of pure nature doesn’t seem to be completely deserted. Before they know it, those four city boys, Luke (Rafe Spall), Dom (Sam Troughton), Hutch (Rob James-Collier) and Phil (Arsher Ali), make some bizarre and disturbing discoveries. And this because of an incident with Dom hurting his knee. They decide to take a shortcut through the woods. Due to a storm, they get lost in this Scandinavian forest rather quickly. They spend the night in a deserted wooden cabin (well, cabins in the woods usually house something bad as we know) where they discover a kind of occult statue and experience a night full of frightening nightmares. And that’s the moment this adventurous hike slowly turns into a survival trip. An entity and guilt feelings. That’s what’s troubling them. It’s not only a mysterious entity these gentlemen have to worry about. Inner, personal demons are also involved. Especially Luke who’s still troubled by guilt about the incident where Robert (Paul Reid), the fifth member of this friend’s club, lost his life. This creates surrealist delusions and you’ll see the interior of the night shop being projected into the threatening forest. And gradually, reproaches about this are also expressed by the others. The things that were never pronounced, emerge under these traumatic circumstances. And this creates an even more intense atmosphere. On to the next Netflix Original. Unfortunately, the denouement isn’t of the same level as the first part. The fact that it’s not about demonic forces (such as in “Evil Dead” or “The Blair Witch Project“) but something ancient and primitive, is pretty disappointing. The final run is still exciting enough though. I thought this movie was a mix of “Razorback” and “The VVitch“. The title of the film partially explains what it is about. And to be honest, I thought the creature was original and the CGI section looked professional. But despite the devilish atmosphere and the excellent camera work (without using excessive amounts of special effects), it still felt like a missed opportunity. There are a lot of situations that you’ve seen before in sort like movies. And many stupid decisions were made even though they were (in my opinion) highly educated fellows. And finally, at some point I thought they were kind of annoying who don’t want to work together in a constructive way. But despite everything, I certainly won’t neglect other Netflix Originals. That would be a stupid decision.